B.C.’s new curriculum, as I discussed in my last post, has meant some radical changes to subject content in every grade, but perhaps none so much as in Grade 6 Social Studies. Socials used to be: Japan and Peru. I remember studying Japan and Peru when I was in Grade 6… and I’m no spring chicken! That is only from two subtopics! I didn’t even get into media, migration of people, or systems of government! Altogether there must be about 50 individual suggested topics just in Social Studies alone. That’s a lot for 12 year-olds to handle. Lucky for us, our Grade 6 Social Studies teacher was excited to dig into the new material. James Weber, who used to be my office-mate and the school’s inquiry teacher before he went to teach in Dubai for two years, returned to Vancouver and joined the team at the last minute due to a sudden vacancy. Even the redoubtable James, however, was daunted by the number of learning outcomes and the lack of direction in how to teach them provided by the Ministry of Education. Luckily, after learning about Guided Inquiry from me, we realized that following the eight phases would lead to a rich learning experience for the boys. With such a vast array of material to “cover,” GID seemed like a natural approach: expose the boys to many different ideas in the Open, Immerse and Explore phases, and then let them identify a question of interest to investigate on their own. Thus the Problem Finders Project was born. 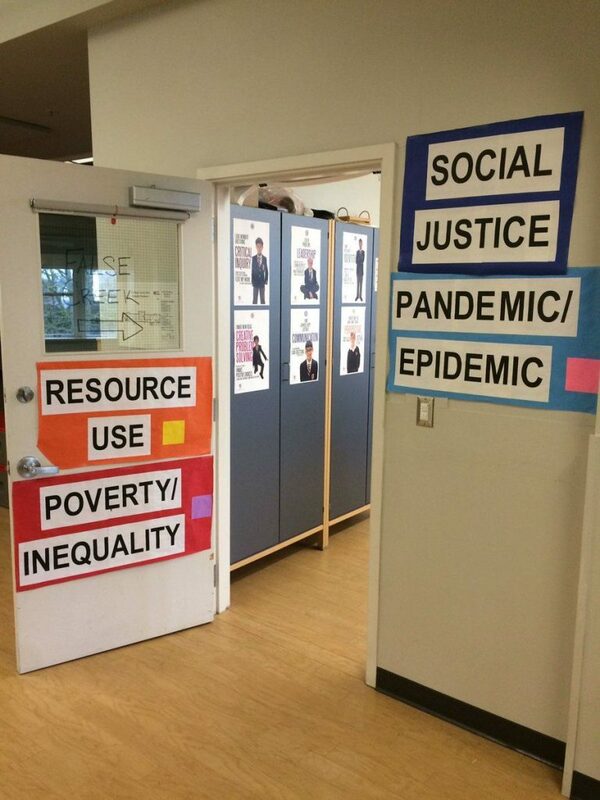 The Open phase was a simple gallery walk in the classroom: James posted about 20 photos around the room, each one related to at least one topic in the curriculum. Without prompting or frontloading the boys observed each photo and jotted down ideas or questions it inspired. As the instructional team was planning the project, however, we realized that the Immerse phase might be a challenge to execute. With so many possible topics, how could we possibly provide an Immerse experience that could touch on all these ideas at once? Since James and I used to work together in the library, we had a brainwave. What about a giant Human Library session where we invited as many possible guests in who had some experience with any of these topics, and boys could rotate around and ask questions? And that’s exactly what happened. The Grade 6 team put out feelers to parents, friends and community members, and many people happily volunteered. We had dozens of Human Library guests, with expertise in health, politics, environment, indigenous rights and many of the other topics suggested by the Ministry. A list was provided on the boards so boys could select topics of interest, and they rotated around for 10 minutes of discussion with the guests. This provided the students with an opportunity to put out feelers on these disparate topics, and start to formulate ideas of their own. 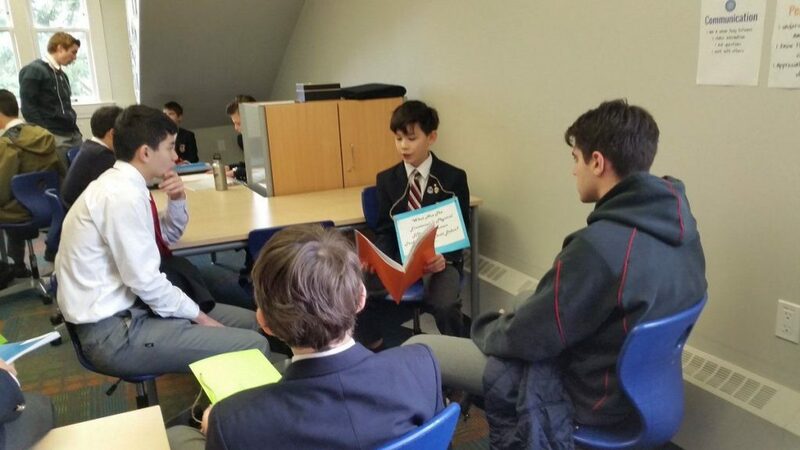 Following the Human Library Immerse session, the boys went on to Explore using our library databases, as well as meeting in inquiry circles with faculty members to continue to talk through all the ideas they had encountered, and to begin to identify a question to research further. 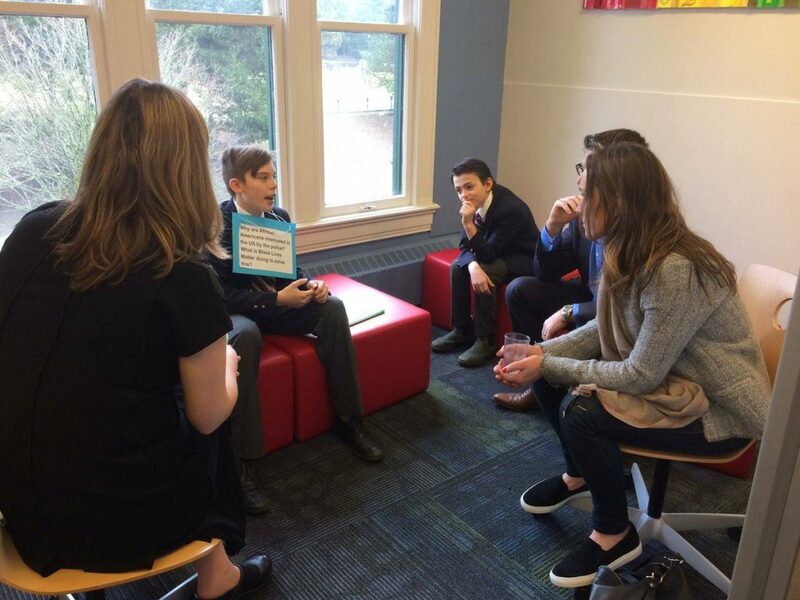 The Problem Finders Project thus continued through the phases of Guided Inquiry, and when it came time to decide how to Share their learning, we planned another Human Library event – but this time, the students were the experts! Each boy wrote his inquiry question on a sign that he hung around his neck and held a portfolio of his work throughout the project – this included a magazine article, a slam poem, a letter to a stakeholder, as well as his notes from various stages of the project. The rooms of the Grade 6 neighborhood were dedicated to the different curricular topics, and the guests – parents, teachers, and other students – selected topics to rotate around and discuss with the Grade 6 experts. A list of all the Grade 6 boys and their topics was provided for guests. Rooms for Human Library appointments were arranged thematically. To say the day was a success is an understatement. The level of knowledge the boys displayed was incredible – and they were able to delve into difficult topics with admirable maturity and insight. Parents and teachers were astounded at how well the boys were able to discuss their topics. Even the P.E. teacher, who sort of reluctantly wandered up at one point, told me he had never seen boys so engaged in an activity like that! Designing the Share session as a Human Library event made it very low-key for everyone. The boys did not feel like they had to spend extra time preparing – since they knew their topics inside-out – and there was no pressure to perform for the visitors. This student is explaining his research on human trafficking to Senior School boys! Small groups of parents and other students met with the Human Library experts. How can Canada and B.C. ensure that we are getting more electric cars? What are we doing? How has human trafficking developed and changed in China? How has the relationship between the Canadian government and the First Nations changed over the years and what will it look like in the future? What are the emotional effects of human trafficking and child labour? How and why did the Mexican drug war start? Why has society become increasingly racist towards aboriginal group? What have the aboriginals have done about this and how does it relate to African American Racism? If the Grade 6 team had approached this as a typical unit – with textbooks, quizzes, class discussions – so much of the rich learning would be missed. 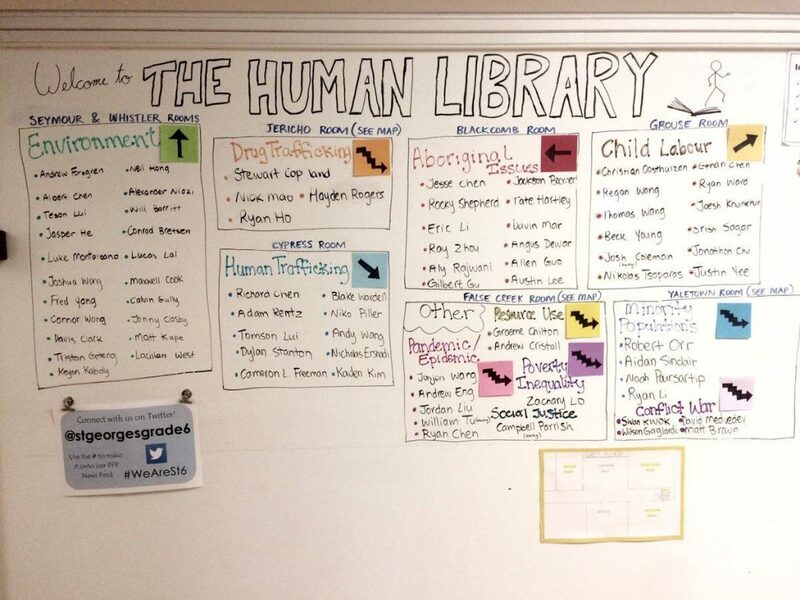 Using the Human Library model in our Guided Inquiry Units this year has been a very successful endeavour, and one I would encourage other schools to try out! Take advantage of the expertise amongst your parents, friends and larger community, and you will be amazed at the connections and learning that will take place. I’ve had a great time guest blogging here this week! Thank you so much for reading, and do get in touch with any questions or comments.